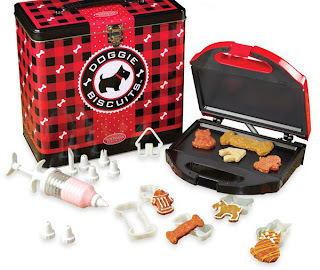 Bed Bath & Beyond offers this Doggie Biscuit Maker Kit for order online. It's priced at $29.99 and comes with six different shaped biscuit cutters plus a decorating kit. Our kitties would be green with envy -- if they were the kind of cats who actually liked treats! That looks pawsome. Yummy. What fun. Have a fabulous Friday. How cute! The hydrant cutter gave us a good laugh! That is so cute and so unfair that there isn't one for cats. our Dakota would LOVE one! It's cute and all...but I don't want to make my OWN treats. That's what the staff is for. hmmm...wait...is that salmon flavored icing??? Oh fun! Just what every gourmet pup needs - his own homemade panini treats....I'll have to show this to my Mom....she doles out my treats from a little plastic bag! Harumph! I think my woofie pals would love it! 29 bucks is a little pricey. Will pass on to my friends.